While using Scabery Expression Calculator, you will never get confused in your calculations as you will always see all the expressions you are calculating as well as the current operation. Scabery Expression Calculator contains the history of calculations that you can always save into a file and then load from the file if necessary.Scabery Expression Calculator can save an unlimited number of variables that can also be saved into a file. ...... file. Scabery Expression Calculator has a customizable view especially to make the work with it as comfortable as possible. All the settings are saved that is why you won't have to spend extra time to customize the application view. Scabery Expression Calculator loads as soon as your operating system starts and is in system tray, so you can start it if possible just with double clicking its icon without looking for it in the "Start" menu. Scabery Expression Calculator also has a mortgage calculator that will always help you to calculate your monthly or total mortgage or loan payment. The product contains a base converter supporting hexadcimal, decimal, octal and binary number systems. 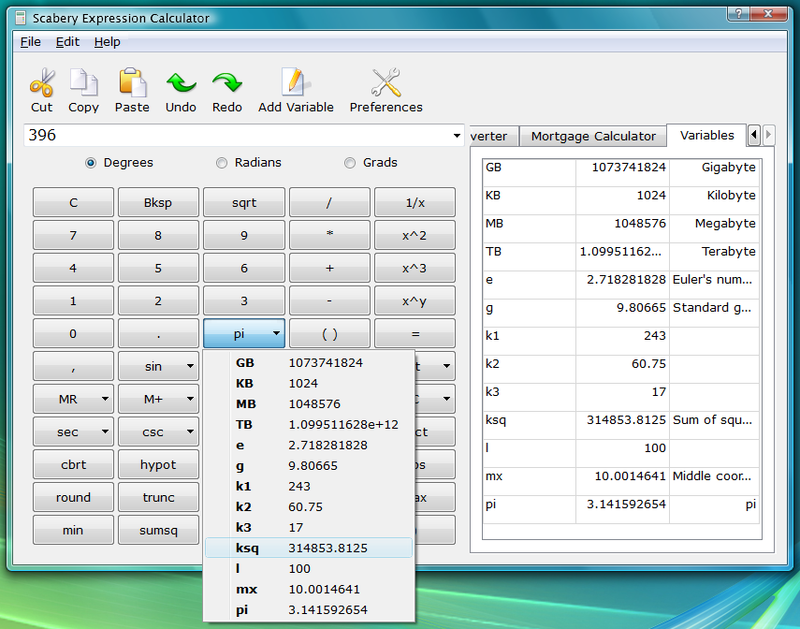 Scabery Expression Calculator has over 20 built-in functions and trigonometric functions can be calculated in degrees, radians or grads. The calculator can always remain on top of the other windows if you switch on a corresponding option. Qweas is providing links to Scabery Expression Calculator 2.0.4 as a courtesy, and makes no representations regarding Scabery Expression Calculator or any other applications or any information related thereto. Any questions, complaints or claims regarding this application Scabery Expression Calculator 2.0.4 must be directed to the appropriate software vendor. You may click the publisher link of Scabery Expression Calculator on the top of this page to get more details about the vendor.